The new app, in beta, is now available for download from Apple for free. The company's site advertises that it will give users "a taste of what's coming in OS X Mountain Lion," set to be released in late summer 2012. 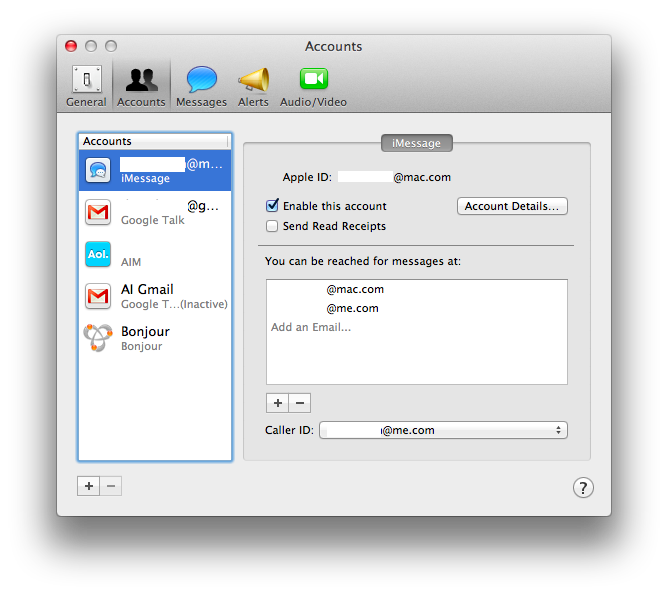 Apple notes that installing Messages replaces iChat, although it replicates the features of iChat, allowing users to continue to connect to AIM, Yahoo!, Google Talk and Jabber. Messages is essentially iChat 6.0, renamed to fit the iOS app name. Apple will be doing the same renaming with iCal and Address Book in Mountain Lion, harmonizing with iOS' Calendar and Contacts, while also adding Notes and Reminders to make the Mac experience more familiar to iOS users. The new Messages chat client seems to encourage users to migrate from other IM accounts to using iMessage, which provides additional features, including delivery receipts and the ellipsis signal indicating that the other party is typing. This feature is also hinted at in the app's new icon. 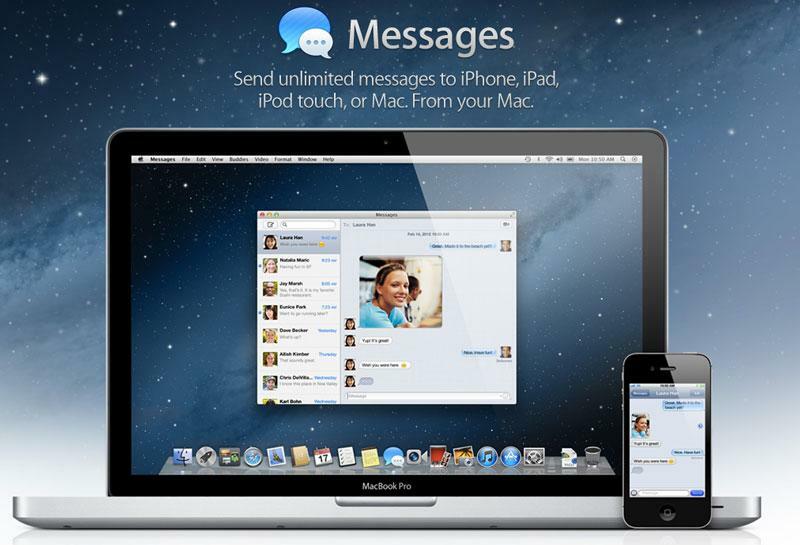 The other advantage to using iMessages is that they are also broadcast to your iOS 5 devices, allowing you to start a conversation on your Mac and continue it on your iPad or iPhone. Messages doesn't replace the existing FaceTime app, although it includes a button that will launch a video chat with the party you are chatting with using the FaceTime app, but bypassing the need to look up the contact in the FaceTime app. Apple may further integrate the functionality of the two apps in the future. FaceTime and Messages both use Apple's push notifications servers, which allow the company to deliver messages and files or setup video conferencing sessions addressed to an email. It's not necessary to use a .Mac or .Me account from Apple; any email address will work, as Apple simply associates the email address you want to use with the hardware you associate with your iCloud account. In the iMessage account configuration of the Messages app, you can specify multiple email addresses you can be reached at, and set the "Caller ID" email address your recipients will see when you contact them. You can also optionally send read receipts so the other party knows when you've read what they've send you. From the address field of an ongoing chat, you can also dynamically switch from an AIM or other type of chat conversation to using iMessage, if the other user is also using the Messages app on a Mac or iOS device, ensuring that you'll get copies of the conversations across your devices. If you have configured different devices to use different email addresses with iMessage, you may find that incoming messages are only sent to one device. 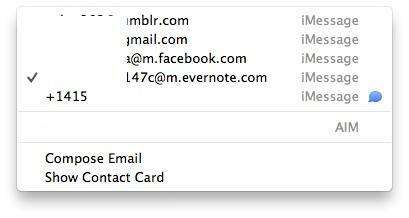 This can happen if you migrated from .Mac to .Me and continued to use a .Mac address; the iCloud setup defaults to using the newer .Me email address. This can also be exploited to keep iMessages from going to all your devices (such as if you only want certain chats to be on your desktop Mac), or alternatively you can configure your iPhone and Mac to use different email addresses so you can chat between them. Apple handles addressing of iMessage chats intelligently, allowing you to type the first letters of a contact or buddy's first or last name. If you have lots of contacts and AIM buddies with similar names, this might return a lot of options, as each contact might have multiple email addresses, phone numbers or other chat accounts associated with it, as depicted below. If that's an issue, you might instead prefer to click the plus icon and look up user's names via the iOS-like scrolling list of Contacts or Buddies, or use the search field to help narrow down your options. Messages seems to work well, although there are a few rough edges, including support for changing text size. You can increase or decrease the text size of messages, but the controls to do this sometimes redraw the text in unexpected ways. After changing the text size, the menu option to "make text normal size" remained greyed out. The messages window is also rather large with a lot of white space. This makes it look nice but it consumes a lot of desktop real estate for the amount of information it displays. There also doesn't seem to be a way to hide or significantly reduce the size of the message tabs, which minimally take up a third of the messages window, an information display that's a lot less efficient than the iPhone's "one conversation at a time" display. There's also no support for being alerted to incoming iMessages unless the Messages app is actually open, something that the FaceTime app for Mac can handle. It launches itself and presents an incoming connection request. With iMessages, there's no prompt until you open the app, and even then it doesn't necessarily flag new messages as being unread, although it does time stamp them so you can see when they were delivered. Messages will no doubt evolve, and likely integrate with Mountain Lion's new Notifications Center to provide a consistent way to be alerted to incoming requests. Overall, Messages provides a nice enhancement of the former iChat, and seems to be stable enough to use as your regular chat client despite its "beta" designation.